Have you ever been in a room full of people younger and more hectic than you, and while you sort of wanted to be on the same page with them, you were perfectly happy staying in your own lane? That’s kind of how it was for me watching Cooper Barrett’s Guide to Surviving Life, Fox’s newest comedy of the wacky variety. Unfortunately, though, the actual comedy came far less frequently than the show seemed to think it did. The set-up is certainly one ripe for as many complicated adventures as 22 minutes can handle. Jack Cutmore-Scott, best known for a small role in Kingsman: The Secret Service, is the titular Cooper Barrett, a 26-year-old social vagabond who still hasn’t quite figured out what he wants his post-college life to amount to. An amalgamation of Parker Lewis, Zack Morris and a third generic Bro, Cooper is the kind of guy who constantly gets himself into troublesome and over-the-top situations while keeping the audience in the loop through talking to the camera and providing narration. Unlike Cutmore-Scott, everyone else in this show is pretty recognizable to anyone who’s been watching a lot of TV in the past few years. 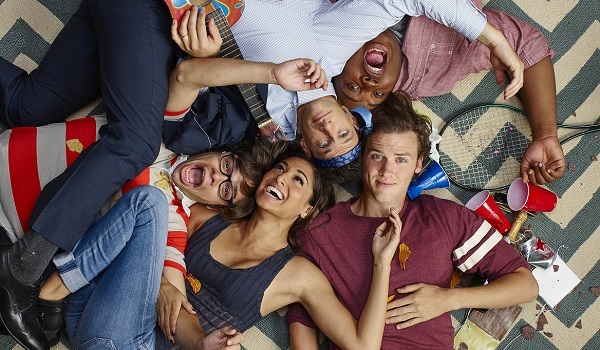 Cooper lives with his two best friends, the nerdy Neal (Hung’s Charlie Saxton) and the boisterous Barry (Glee’s James Earl), and he’s slowly falling for his next door neighbor Kelly (Being Human’s Meaghan Rath), who doesn’t quite share his feelings. Cooper’s older brother Josh, a 40-year-old married guy who tries to live vicariously through his more unhinged sibling, is played by Justin Bartha, and he isn’t the only thing that will remind you of The Hangover. The show is basically a small-scale version of the same generic outline. Bros being bros! Each episode of Cooper Barrett’s Guide to Surviving Life centers on a particular problem, such as losing a phone or not having enough money in the bank, and takes the characters from a relatively normal Point A down a zigzagged path to a resolution that doesn’t necessarily end happily for everyone. Fox has been the home to plenty of immature comedies in the past, and while Cooper Barrett threatens to get childish – as it did with this advertising campaign – the hijinks are mostly goofy rather than gratuitously insipid. Mostly. Cooper Barret was created by actor/writer Jay Lacopo, arguably best known for writing the 2002 Luke Wilson rom-com The Third Wheel. It’s definitely not the most deplorable first TV effort that he could have come up with, and the show can’t be accused of false advertising where its tone (or BROne) is concerned. The first episode plays with time in a way that I almost wish every episode did, but the rest are unfortunately pretty straightforward in narrative approach. As far as the cast is concerned, everyone does exactly what they’re supposed to do without really standing out all that much. James Earl’s energy is on point, but the character of Barry is about as non-nuanced as can be. I actually enjoyed the burgeoning friendship between Kelly and Josh’s wife Leslie (Battle Creek’s Liza Lapira) more than most other aspects of the show, as it felt perfectly natural, while ridiculous things are happening everywhere else. The first episodes also feature a strange cameo from Paula Abdul, and Cooper’s parents are played by Jane Kaczmarek and Alan Ruck, who sadly don’t show up very much in the early episodes. I don’t see Cooper Barrett’s Guide to Surviving Life surviving a multi-season life on Fox, where cancellations are a dime a dozen, but maybe things will tighten up and get sharper as the season goes on, making even a 33-year-old like me happy to let loose and get caught up in a far-flung adventure or two. Until then, though, I’ll probably just hit up whatever else is on TV at that time. Cooper Barrett’s Guide to Surviving Life is one of many shows debuting in the new year, and you can catch the first episode popping up as part of Fox’s new Sunday lineup on January 3. If you survive until then, that is.